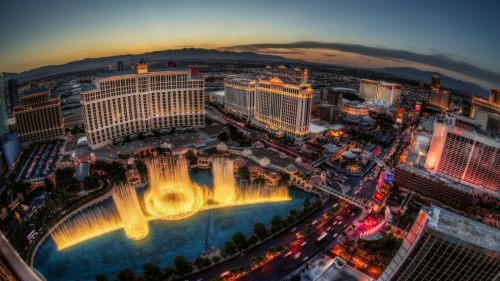 Hotwire is claiming to have a '$50 USD/night' sale on 5-star Las Vegas hotels in the middle of the strip, on dates between December 8 and December 28th. 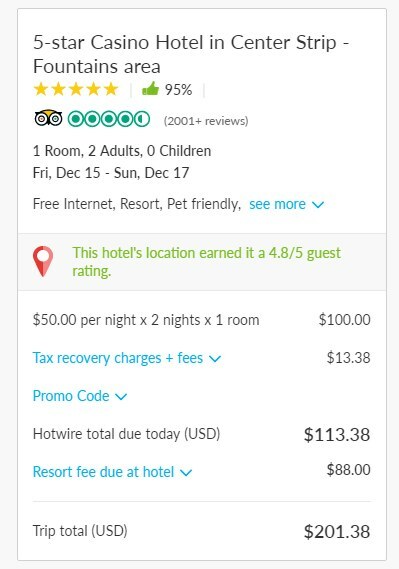 After factoring in the typical Las Vegas rip-off resort fees, and the usual taxes/fees, it works out to be more like $130 CAD/night. Which could still be a very good deal for a weekend rate at a 5* casino hotel, depending on the hotel. The real question mark though, is which hotel you're getting. Hotwire doesn't tell you up front. But there's no guarantee that it will be one of those hotels. Checking out this deal, I found that there were Friday to Sunday stays available between December 8 and December 28th. Try dates between December 8 and December 28th, 2017. It can only be for a maximum of 2 nights. (Although there might not be anything preventing you from making more than 1 booking). IMPORTANT: The prices you see on Hotwire will be in $USD.